Vacation rental condominium. Sleeps 4, 1 bedroom, 1 bathroom. No pets allowed. 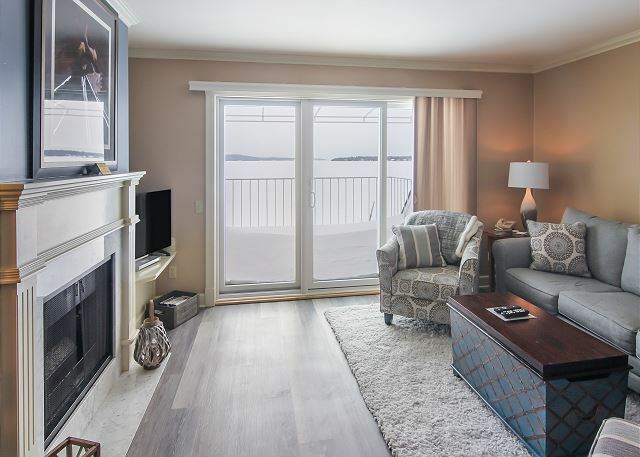 Suite 313 is a third floor suite with breathtaking views of Lake Charlevoix from both the living room and upstairs bedroom. 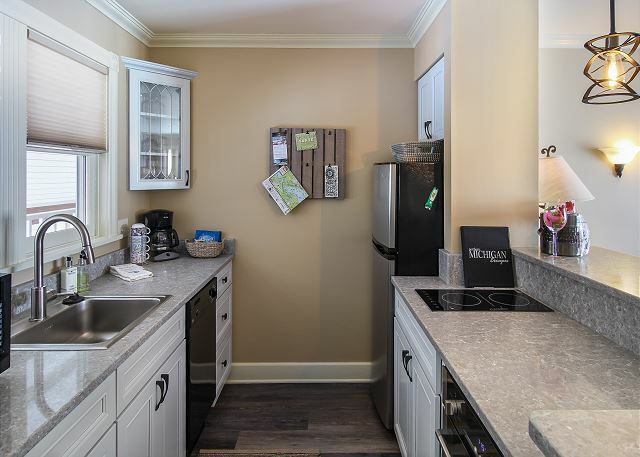 The kitchenette is equipped with dishes and utensils ready for in-suite meals. 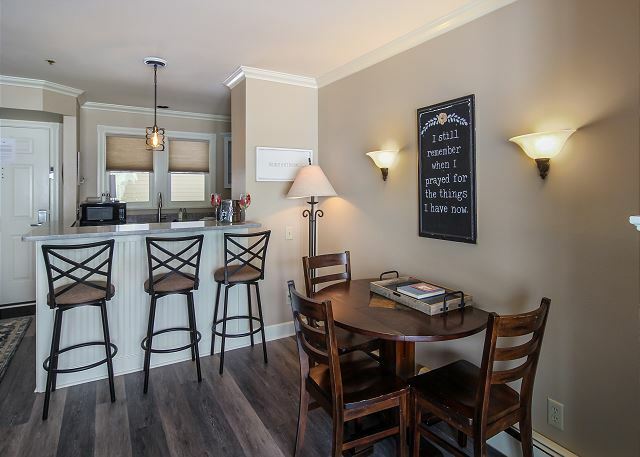 The kitchen offers a dining table for two and two barstools for extra seating. The living room features a queen size sofa sleeper, gas-log fireplace, and flat screen TV. The sliding glass door opens to a private balcony that overlooks our private beach. 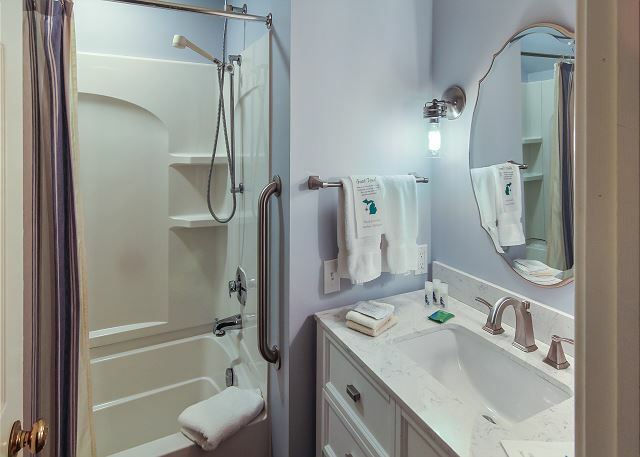 Upstairs you will find an updated bathroom with a large walk-in shower, along with one bedroom featuring a king size bed and flat screen TV. 100 % of our reviewers would recommend this vacation rental. 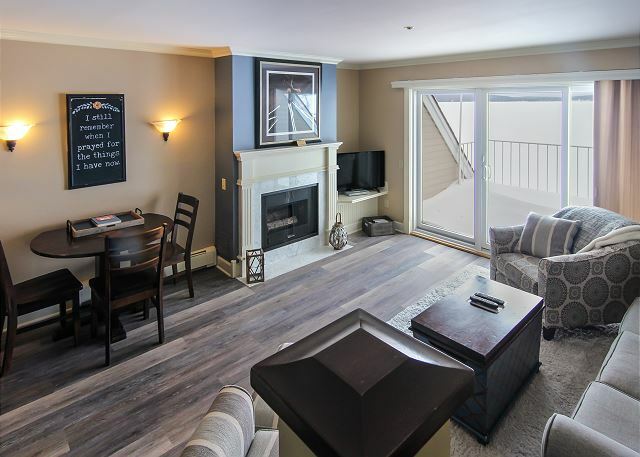 We stayed at this wonderful condo at Water Street Inn to kick off a celebration week of our 45th anniversary. It was rainy most of the days we were there but that didn't stop us from experiencing the city and enjoying the views from this waterfront condo. The accommodations were very nice, with an efficiency kitchen good for having our breakfast every day before hitting the site-seeing. Spent the first day just checking out the town, meeting some of the locals and experiencing the good eats and beverages at Boyne City Tap Room, Cafe Sante and Red Mesa. Wasn't very impressed with Friggy's right across the street. Just a bar but it's probably hopping during peak season. Drives to Petosky and Charlevoix also were within easy reach. Late Sept./early Oct. is a good time to visit if you don't like a lot of crowds. We had a suite on the 3rd floor so the bedroom was on the upper level. Okay for us but not ideal for those who have difficulty with stairs because the bathroom was on that level too. We enjoyed sitting on the porch and watching the sunset one night that it wasn't raining. The staff at the front desk was very friendly and helpful. Would definitely recommend and return here again next time we're up this way. 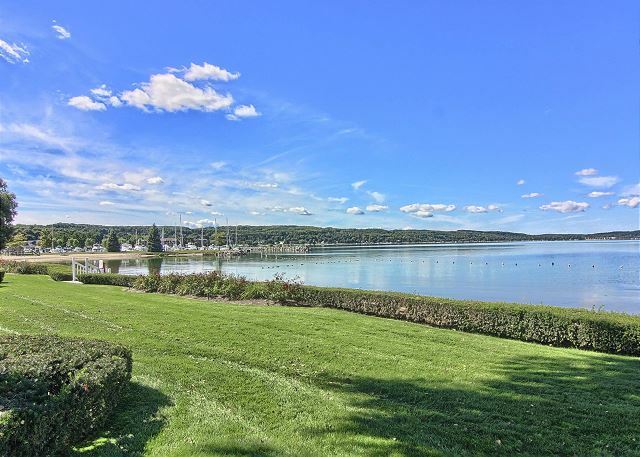 This is a very nice location on Lake Charlevoix. 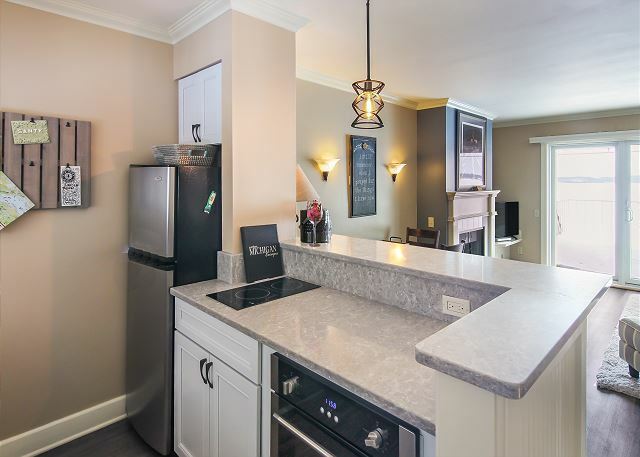 This condo had everything we like & needed for our stay. I had the pleasure of spending a few very short days in a beautiful, comfortable unit with a spectacular view. My only complaint is that my stay was too short. I did NOT want to leave. It was my second visit. I found both visits, two different units, to be equally charming. Thank you. I can’t wait until I visit again. We enjoyed our rental as it was centrally located to many areas we enjoy visiting. It was very peaceful, clean and everyone was very friendly and helpful. Everything was as advertised and better. Thanks. Everything was fine. Refreshing of the condo was good, but was not a complete cleaning, but it worked out well. 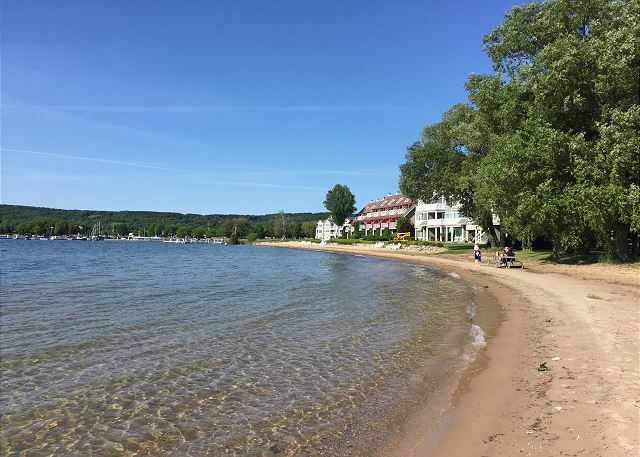 We had a fabulous time in Boyne City this past week, and it made it even better due to the awesome accommodations at Water Street Inn. The location and amenities were all perfect. And the support staff were helpful and friendly. We'll definitely be back! We stayed in room 313, lovely living room with kitchen, bathroom and bedroom are both upstairs which we really liked. 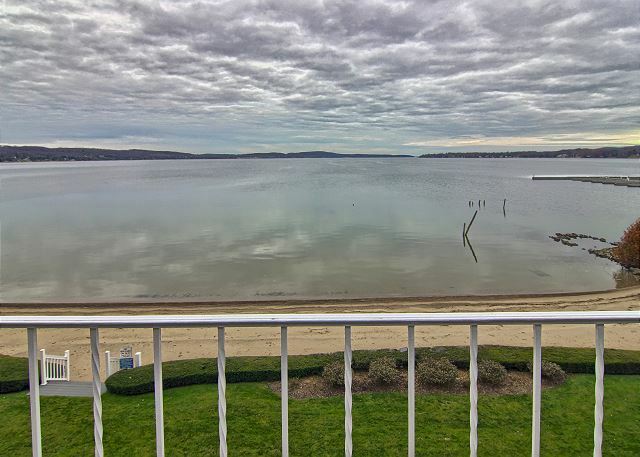 Beautiful view, right on the water with a lovely beach. Restaurants are all within walking distance. 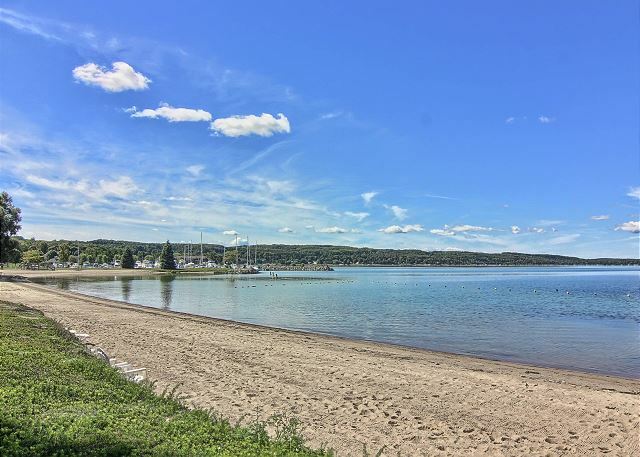 Charlevoix is a 20 minute easy drive, Petoskey, maybe a half hour and Harbor Springs 45 minutes. Perfect location and perfect destination for us. Gary, Thanks so much for the 5 out of 5 rating. We really appreciate it, and so happy to hear you had an outstanding stay. I absolutely love staying at Water Street Inn. It is beautiful, quiet, the staff is very nice. The rooms in general are very nice and very clean, well equipped with what you need. I highly recommend staying here at anyone that wants a nice relaxing getaway. The City of Boyne itself is also very nice and clean. A lot of fun things to do and shops to visit and places to eat! We had a wonderful stay at the Water Street Inn... everything was so clean and the view was spectacular!!! Love how everything was walking distance! We will definitely be staying again when we visit Northern Michigan in Boyne City!!!! We had a great stay in unit 313. 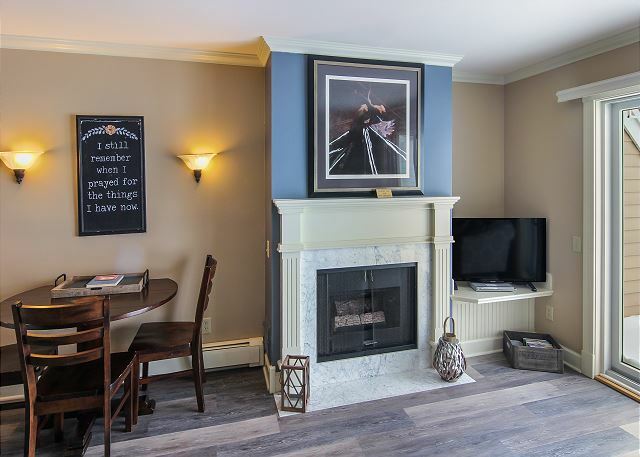 It's a great location close to Boyne Mountain. The conod is well appointed and comfortable. We always stay in this unit and the stay is always grat. It's a fantastic value. Enjoyed our stay. Great location in town, on the lake, and close to skiing. 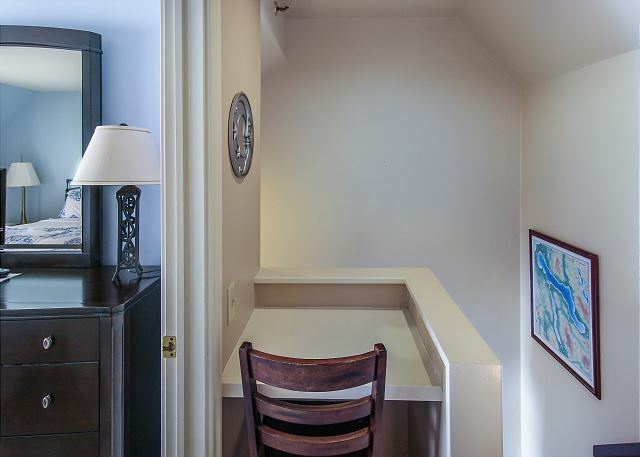 The condo had a good layout with plenty of room for family and friends. Perfect location to walk to food and drinks. Short drive to Boyne Mountain. The rental was very quiet. I would love to return in the summer. 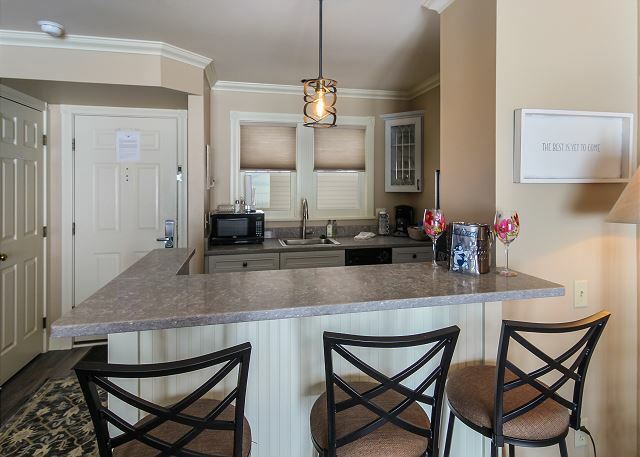 We rented a condo so we could do some skiing at Boyne Mtn without paying the outrageous lodging prices at the Mtn. This place was great! Nicole even changed us to a condo that was more updated than the one we were booked for without us asking. We didn't know there was a difference. Condo 313 was clean, updated, and everything we needed to make the weekend great. We loved having a little kitchen to make breakfast and enjoy coffee before heading out for the day. 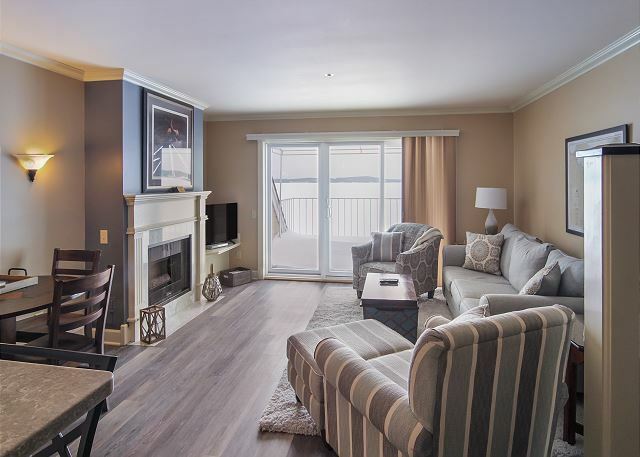 It is conveniently located in Boyne City- walking distance to shops and restaurants for apres skiing enjoyment. Hope to return soon!! We were so thankful to Nicole for getting us a room at the last minute, our place that we had planned to stay at was not ready, and after a few late evening calls, she came through with a great little condo for us to stay in for the night! We will be booking all of our northern michigan stays from now on, through her! Overall, it was a great experience. It was a great experience. The accommodations were simple and convenient. My wife and I spent a week at The Water Street Inn in September. We stayed in unit 313 and it is a very nice condo. The lake view from the balcony and bedroom is fantastic. The condo was clean and comfortable. Check in was easy and there is plenty of parking. Easy walk to the the downtown restaurants and shops. There is daily maid service which is unusual for a condo rental. The great thing about the 3rd floor unit is the bedroom has a view of the lake. The only negative is the air conditioner. It is in the wall at the top of the landing and it is very loud. Also, for it to cool the bedroom, the bedroom door must stay open. We had guests stay for two days and we had to choose between privacy or cool room. The loud air conditioner did help at bedtime one evening when a group in another unit was having a loud get together late into the night. The noise from the air conditioner kept us from hearing the party. 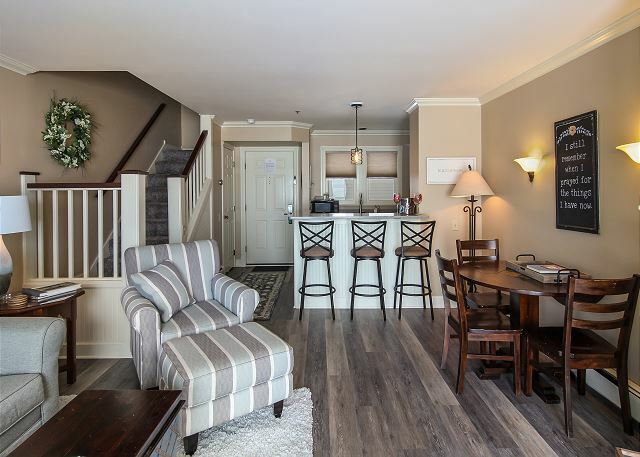 If we have the chance to visit the area again, we wouldn't hesitate to stay at The Water Street Inn. Great, only place I would want to stay at in Boyne City, Mich.
As expected, everything was fine and met our expectations. Select/Confirm the number of travelers to get a rate quote. *Seasonal rates are estimates only. Actual rates may differ. Seasonal rates do not include fees or taxes. To request information about booking this vacation rental, please fill out the form below. Your email has been sent successfully!